I couldn't stay away. Turns out I'm a little addicted to blogging. Plus there are some fun linky parties I want to join making it all that much tempting so here it goes. 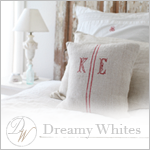 I originally did this post when I guest posted at Kara Paslay Designs. I thought I'd repost it here on my blog because it's one of my favorite projects from this year. 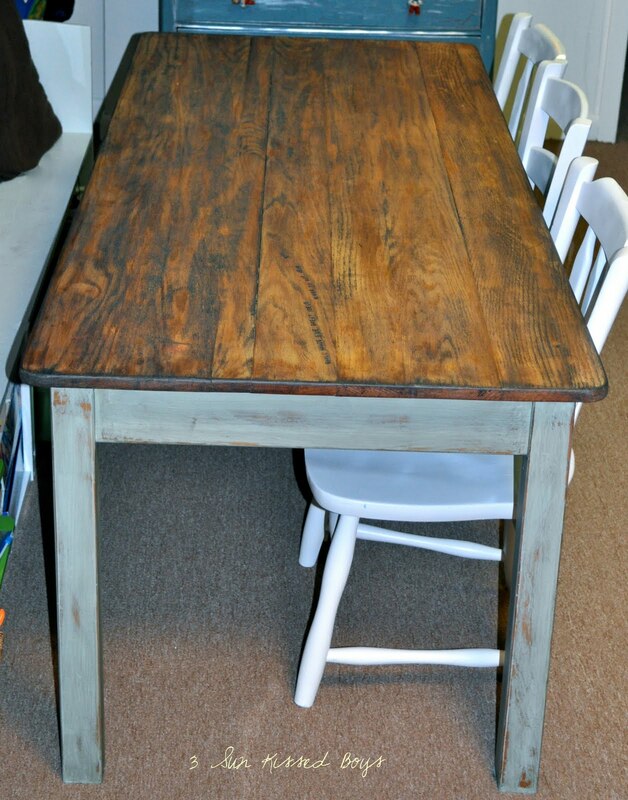 My friend, Gina, gave me this little kids table for the Sun Kissed Boys’ playroom. It came from a private school that closed down. The table is a very authentic school table. So much in fact that it even came with gum stuck at the bottom of it. I wanted the table to have that old-world feel like it had come from a schoolhouse from many moons ago. First thing I did was sand it completely. Ok, Sun Kissed Husband sanded most of it for me because he knows how much I detest prep work. 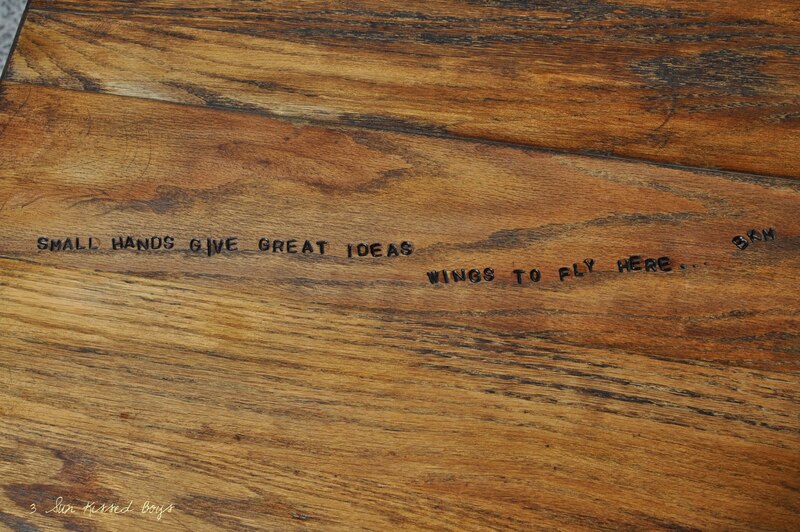 I wanted to engrave it with an inspirational quote like a table I’d seen at Sticks and Bricks. For the letters I used a metal letter stamp set. 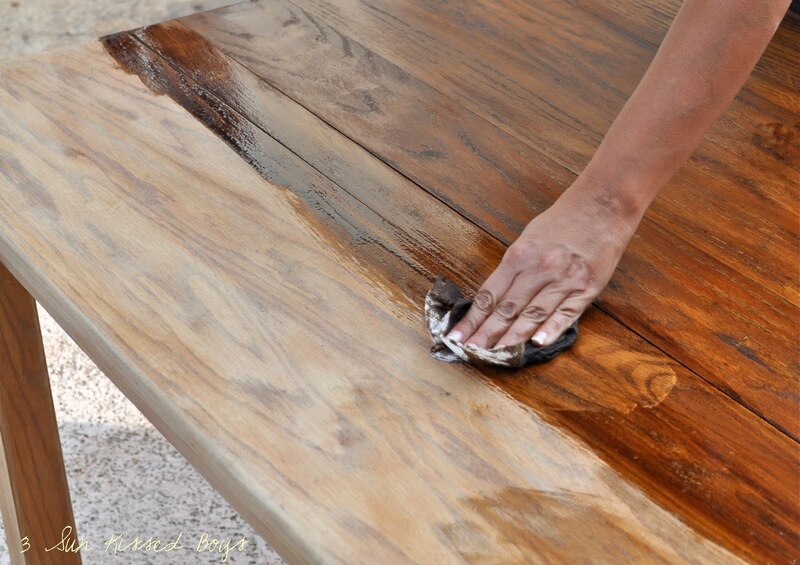 Next, I stained the tabletop. After that dried, I gave it a very uneven sanding using a fine grit, wiped it, and sealed it. The reason for the uneven sanding? Wood is not one even color and it certainly doesn’t age evenly either. I wanted to keep the dark stain but the letters were not standing out as much as I wanted them to so I used a permanent marker to darken them. For the quote, I turned to freelance writer, bkmackenzie of signedbkm. (I know my talents and being a wordsmith is not one of them.) I told her about my project and she came up with several different quotes for me to use. I chose this for the table. I have plans to use another one of her eloquent quotes in another part of the playroom. For the legs, I gave them a sloppy coat of paint, distressed, stained, and polyurethaned them. I now present to you the ART TABLE in its place and in its use. It now needs an old schoolhouse style crayon holder, don’t you think? The quote is perfect. Thank you for reposting this, I haven't seen this one yet. Have a wonderful day and a Happy New Year!! I love how you transformed the table! The added quote is perfect! Wishing you and your family the best in 2011! You are a genius my dear. I'm loving this. Your table looks great, I bet your boys use it all the time. Thanks for sharing it! that is so totally adorable! How unique and creative. love it. This table is fantastic. I LOVE it. And you did a great job re-working it. Love the quote. 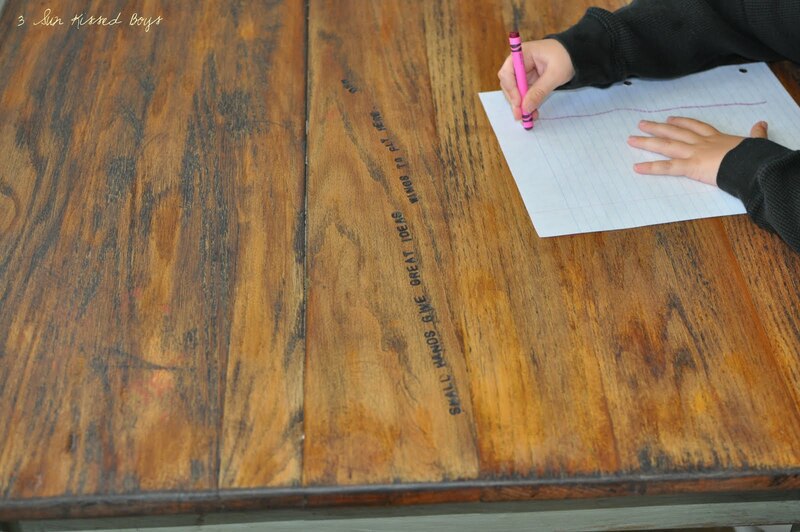 Oh my gosh, I LOVE, love, love this table! 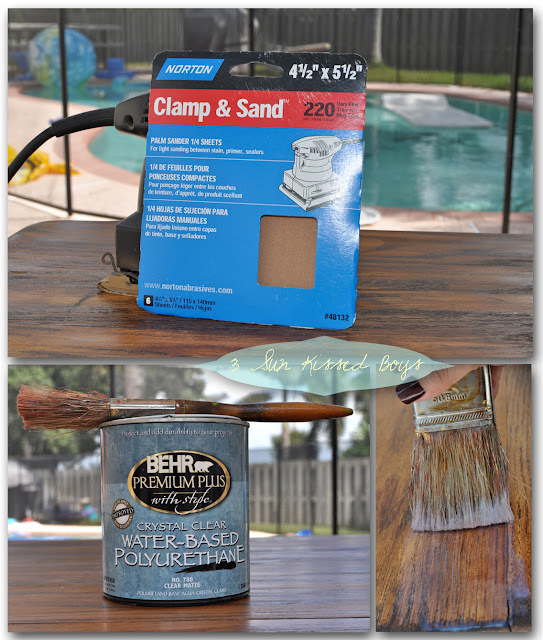 I have never thought of using my metal stamps on wood! GREAT idea! 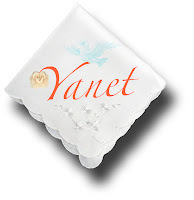 i absolutely love this idea, yanet! it is so cool and unique, and a great way to constantly inspire your children. I love the message you stamped. The table looks great. Beautiful! I'm very impressed with your creativity. 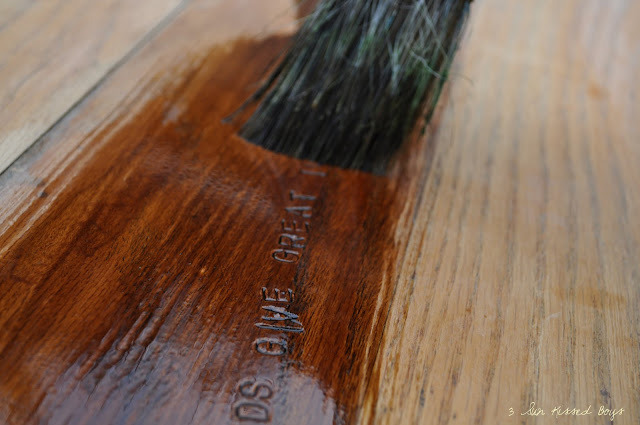 What a great job you did refinishing the table! I'm sure your guys will get many years of enjoyment creating and being creative. You've given them a wonderful gift! Happy New Year! I love how this turned out!! Great idea, putting quotes on it. Very impressive. I love this table. The quote is just awesome! You have great style! I became fascinated with your manicures. Applying stain with a French manicure looked dangerous to me. Then I saw the black manicure, and felt much better. What a great project for your kids!! I am in awe. And I love what you engraved into the table...and the way it looks. I am more than slightly envious. Okay, I covet the table. lovely creation for fine arts. That is one awesome table! I really like the quote you stamped into it. Very cool. gorgeous table, and I really like the quote stamped into it - what a great idea! Yes, I agree LOVE this. 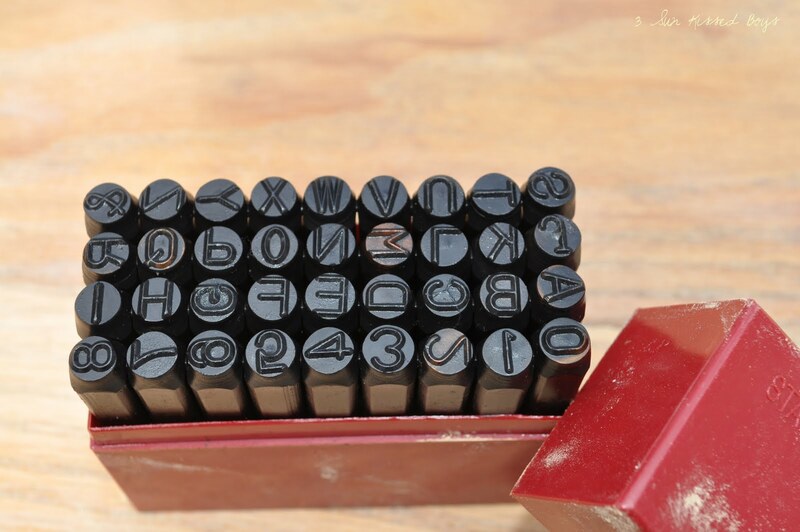 Where did you find your stamp set? I think they are a MUST to add to my list! :) Thanx for sharing! Oh! That table turned out beautiful... well... except for the gum that is!! LOL! I love how you used the letter stamps right on the table top, what a great idea... and I have a letter stamp set so I may have to use this idea somewhere in my house... if you don't mind! For those of you wondering, I got the metal stamps at Harbor Freight. This turned out beautifully! I had a similar table I wanted to keep for ME (not the kids)...but dh didn't go for it! Love the idea of the stamping on top! Loving your metal stamp, that just takes the whole re do to another level all together. What wonderful redo. I love the message stamped in. It turned out beautiful. LOVE it! 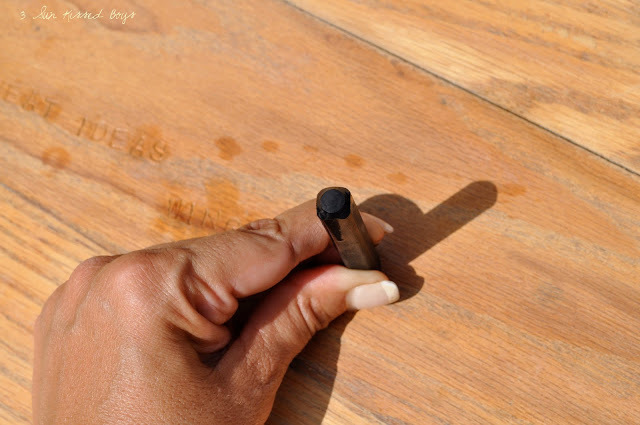 Just adore the black ink on the dark brown stain---very vintage, authentic! Yanet, this an amazing transformation. I think using those metal stamps is the best idea I've seen in so long. That is really, really the coolest thing. Thank you for sharing this inspirational post. I am going to find something to use this technique on. Where did you find the stamps to buy? Thanks for linking. I love this idea for the New Year! This is great! You come up with the best ideas. 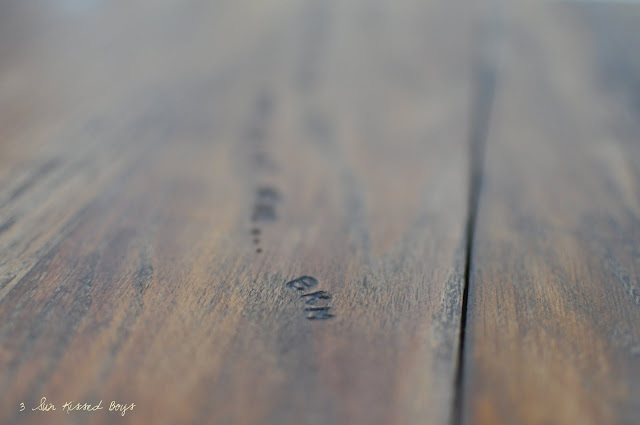 I love how the words flow with the grain of the wood. You did a fantastic job! How did I miss this table!!! I love what you did with it. So great!!! 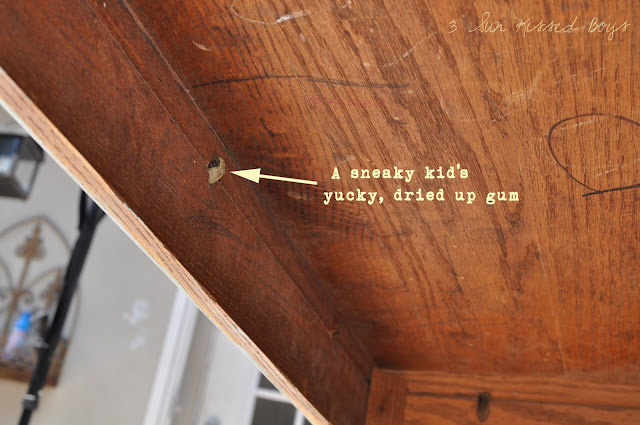 First off, every time I get a table from thrift or craigslist, there is gum! I am less charitable than you about it! LOL Second, one day I am going to use this idea. I love that the quote is stamped in there. I used to go to a restaurant in NJ that had tables carved over the years by patrons. I loved reading all the initials and sometimes quotes. This is just a bit classier and just as sweet. AWESOME!!!! Yes, I screamed that....I LOVE IT...there I go again! I love it! How brave and genius of you to use the metal stamps on the wood. And the Sharpie! It's fabulous. FABULOUS! What a creative idea! 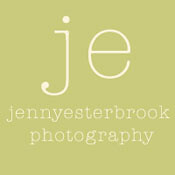 Lovely and subtle...I might just try this myself. Thanks for sharing. This is brilliant! 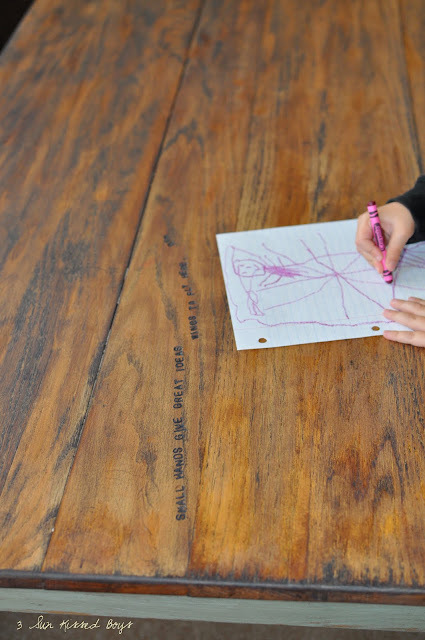 My kitchen table is due for a makeover and my kids would LOVE to have their names on their "spot". Thanks for sharing! 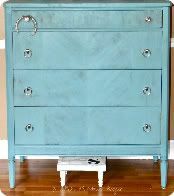 Excuse my ignorance but I'm very new at this repurposing and DIY thing - I love your ideas but I am clueless... how did you do the distressed effect? 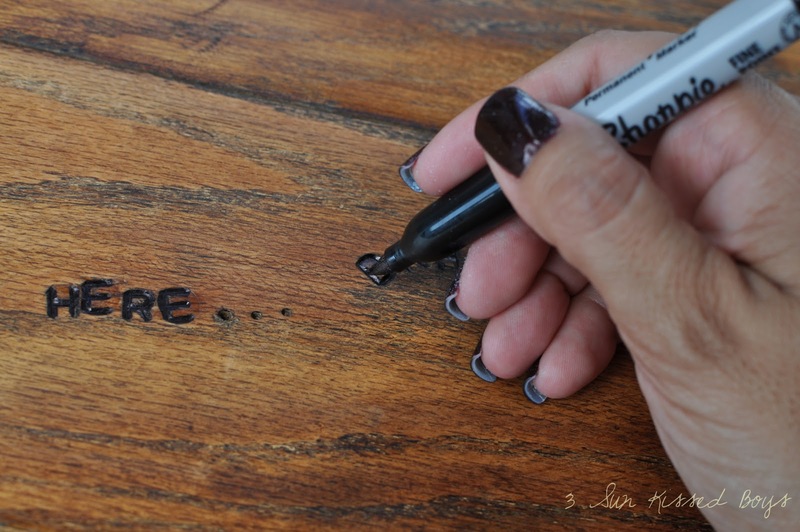 And when you stamped the wood did you have to apply extra pressure (like a hammer!) or do you just press it into the wood? Etc. You'll have to do some beginner posts for people like me! Or direct me if you've already done explanatory posts please!! Thank you , everyone for your kind comments. Sheila, I tried getting back to you back but I couldn't find a way to contact you. In reference to you question about the stamps, you do use a hammer to pound the stamp. The strength you use, depends on the wood you're working with. I would do a couple of letter on the underside of whatever you're working with to test it out first. After a few hammerings, you'll get the hang of how hard to pound. As far as distressing, there are a couple of ways to do it. The way I do it is by sanding. 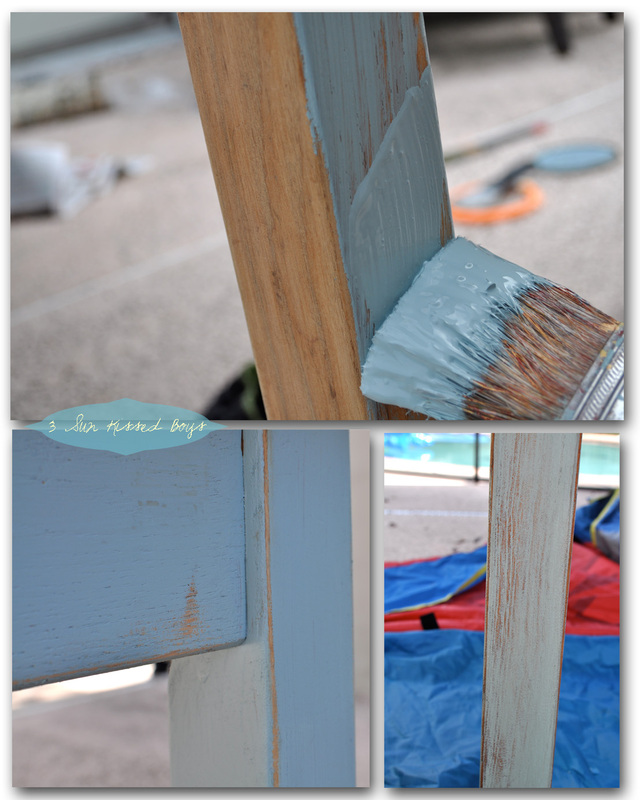 After the paint is good and dry, take sand paper (80 grit) and rub it in the sections you want to look "worn". 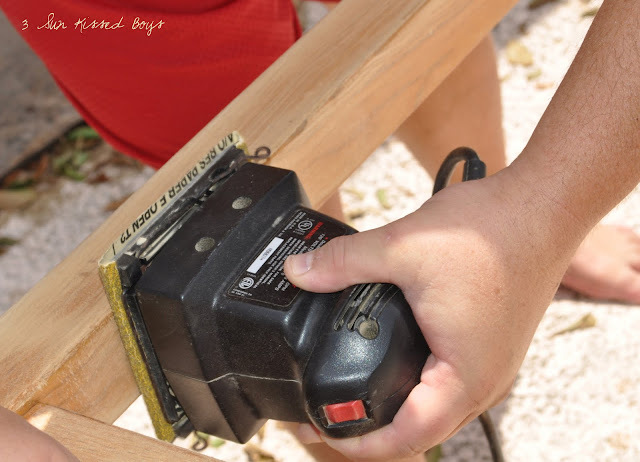 You can also use an electric sander to move a little quicker but I would start manually since the electric sander can scrape off too much. Hope this helps, Sheila. 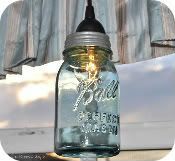 I will definitely keep in mind to do more of a detailed step-by-step in the future for the beginner DIYers. Hi I'm a new follower and just wanted to say ingenious idea for a child's art/play table! 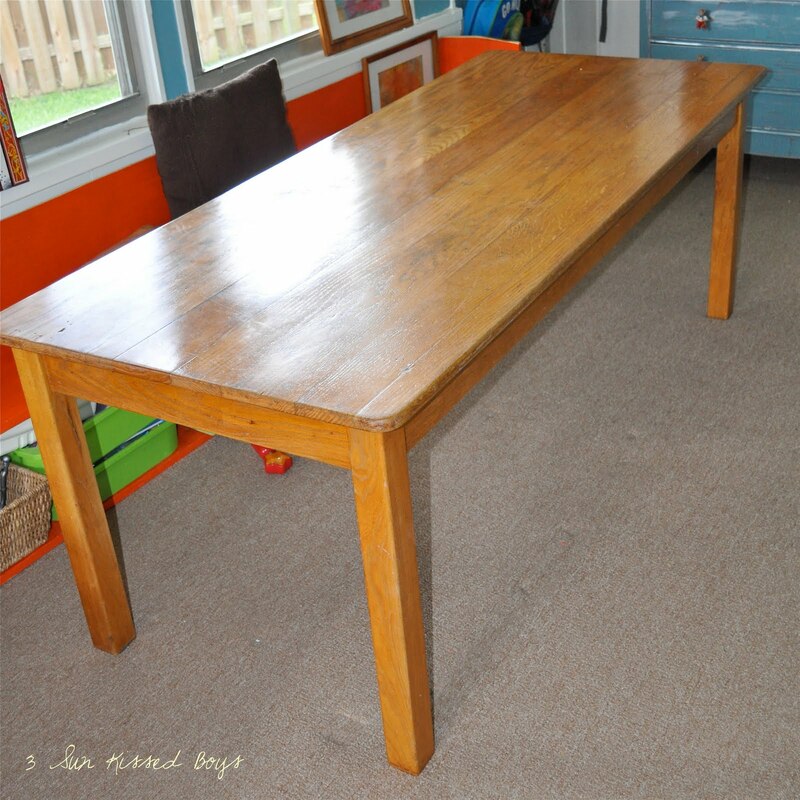 You warmed my heart with this post...and made me tear up a little...I love love love that table!!! I think it is because you have 3 boys (and I do too) and yours are still little and mine are not...You bring back good memories of when my boys were young...and that is one reason I love your blog! and that you are super creative! such a great table...I am a new follower and love your stuff....would love if you followed me back....You are awesome!! I love what you've done with the table. 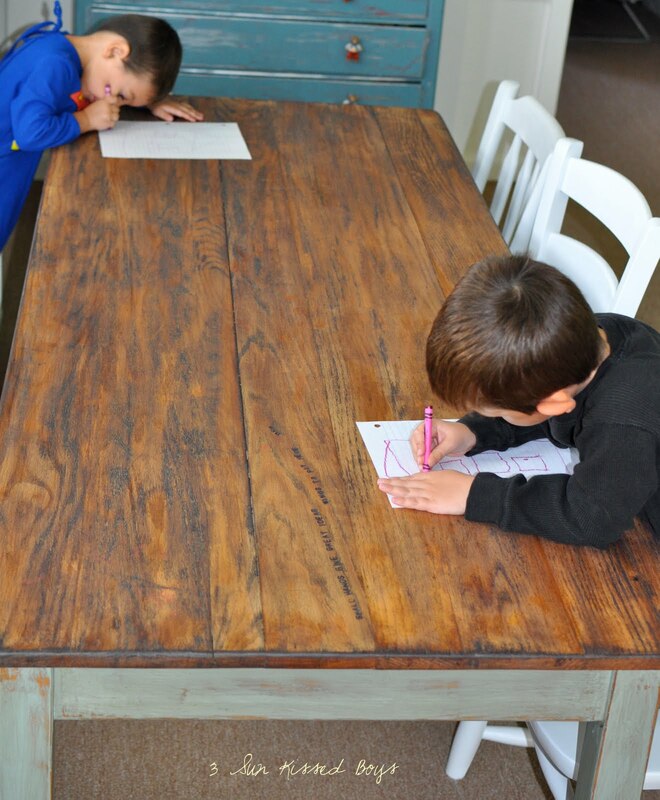 Any ideas on a school table that has a laminate top? Would love to remove it if possible. The Farmhouse Table has a Home!